Colors: black, blue, pink, yellow, red, blue. We invite you to watch below device. These are very inexpensive power bankes if you consider their quality and capacity. This is the equipment of the widely known DOCA company. At your disposal you have as much as 130000 mAh. This is a very large capacity. This charger allows you to recharge your phone several times. The standard phone has batteries up to 4000 mAh. So there should be no trouble to load the phone up to three times. 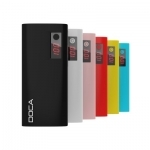 Out of the range of DOCA 13000 mAh charging units this device has the fastest charging plug. Thanks to this electronic device you will be charging much shorter. This reliable charger has a readable display (0 to 100 percent) that informs you how much energy is in the battery at any given moment. An additional interesting addition to the fast-loading powerbank is a small light that you can also use when needed. This device also has two charging outputs. Therefore, you can easily load up to two phones at a time. The fastest portable chargers in its class. Bivak, beautiful day. Today you have gone 30 km. You feel satisfaction, you feel physical fatigue, but your mind is clean and calm. It was a very good day. You have seen a lot of interesting places. They took you to navigation. The hundreds of classes you have done today will be a wonderful memorial. You even managed to put the most interesting photos on Facebook. It was really a very good day. You got a lot of sharing and likes. You finally reach the camp. Your tent, you will rest a little at last. You wash, dinner and go to sleep. Your eyelids close themselves. You fall asleep. A few hours before sunrise you wake up in terror. You forgot to connect the phone to a portable charger. Another long day ahead of you. Your phone is almost powerless. Wait a minute, but no problem, you took with you a very fast portable charger DOCA. After all, for a few hours, until you have been able to charge your phone with no problem. You turn quietly to the other side and return to your interrupted sleep.